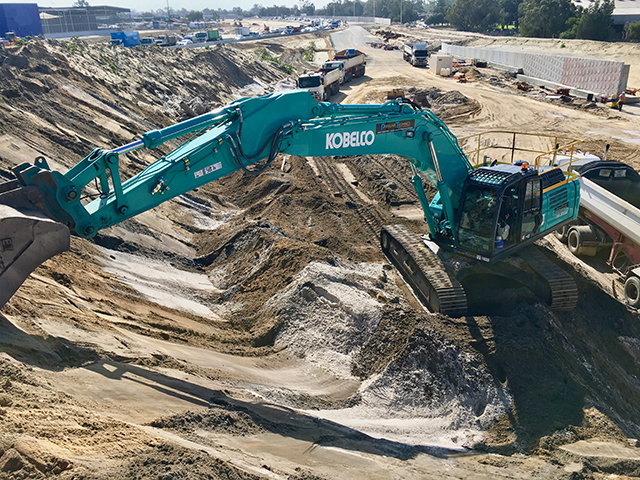 For more than 88 years Kobelco has been developing and pioneering technically advanced fuel-efficient excavators that balance performance with environmental initiatives. “Kobelco's focus is to provide more fuel efficient, powerful, comfortable and safe excavators, as well as to identify emerging trends in the market. We provide new solutions at the right time, such as management of machines in operation and preventative maintenance systems. To this end Kobelco has taken significant steps forward in the creation and adoption of new construction technology under the banner of “IoT Solution”. Here are some examples of what customers can expect now and into the future from Kobelco,” says Doug McQuinn, General Manager of Sales and Marketing. Kobelco’s proprietary iNDr is the world’s most advanced cooling system that ensures quiet operation, protection from dust, and easy maintenance. The iNDr filter removes dust from the intake air so cooling components stay dirt-free and do not require regular cleaning. The iNDr filter itself can be easily removed and cleaned without the use of tools. The stainless-steel filter is extremely effective against dust, with 30-mesh wave-type screen that removes tiny dust particles from the intake air. Outside air goes directly from the intake duct through the iNDr filter for dust removal. Kobelco’s exclusive iNDr Cooling System delivers amazingly quiet operation. Kobelco GEOSCAN uses satellite communication and internet to relay data, and therefore can be deployed in areas where other forms of communication are difficult. When a hydraulic excavator is fitted with this system, data on the machine’s operation, such as operating hours, location, fuel consumption, and maintenance status can be obtained remotely. Accurate location data can be obtained even from sites where communication is difficult. A comparison of operating times of machines at multiple locations shows which locations are busier and more profitable. Operating hours on site can be accurately recorded for running time calculations needed for rental machines. Data on fuel consumption and idling times can be used to indicate improvements in fuel consumption. Provides maintenance status of separate machines operating at multiple sites. The system warns an alert if an anomaly is sensed, preventing damage that could result in machine downtime. Alarm information or maintenance notice can be received through email using a computer or smartphone. Daily and monthly reports of operational data can be downloaded. An alarm can be set on the system if the machine is operated outside the designated time or has been moved out of its designated area to another location. “K-Scan” offers customers daily machine condition checking through remote machine monitoring. "K Scan" conducts daily sensory detection of numerical values that include water and oil temperatures, fuel injection volume and pump output. With that data as its base, the system observes the status of an excavator. When the values reach a certain level, the system suggests appropriate maintenance measures. In addition, a service technician inspects a stationary machine at high idle during maintenance. Together with the status observation, the service technician prevents any possible problems by investigating detailed data carefully to ensure an excavator's stable operation. Kobelco has prepared for the introduction of Off-road engine emission regulations in Australia by adding Tier 4 Final engine models to its current range of Tier 3 engine machines. Kobelco’s range of Tier 4 Final compliant excavators meet requirements of NSW EPA licensed businesses. Models configured with Tier 4 Final engines range from mini through to heavy excavators. Select Tier 4 Final excavators that ship from the Kobelco factory are now ready for the installation of 3D machine control technology, which significantly reduces the cost and complexity of the installation for the contractor. Kobelco works closely with Trimble, Leica and Topcon to benefit both contractors and local dealers, contributing to improving the overall productivity of construction sites. Kobelco K-DIVE offers remote control excavator operation. Called the K-Dive concept, it is currently under development for use exclusively with Kobelco excavators. With K-Dive, Kobelco will provide a means of remote machine control that enables an operator to sit in a replicated control platform, located in an office environment, and be able to see and control an excavator located anywhere in the world. There are many advantages for such a system, including operation of equipment working in harsh or dangerous environments, and to manage operator shortages with the convenience of remote operation without having to travel to job sites. A major issue facing the construction industry is that of eliminating work-related injury or death. Kobelco has introduced "K-EYE PRO", a collision reduction system equipped with an automatic deceleration/stop function that is the first in the construction machinery industry. Doug says, “A decreasing work force, training today's youth for the next generation of workers and on-site safety measures are some of the challenges faced by the construction industry globally. Kobelco's “IoT Solution” was created to address these and other problems that are faced in the workplace. Kobelco will continue to lead the way with innovative technology solutions which enhance the performance of our excavators and reward our customers with improved productivity and peace of mind”.